First, Ryan Sayles interviewed me for Out of the Gutter. He has a column there called The Noir Affliction. Ryan is a very funny guy, though I had to throw him around a bit, and he took a few shots at me. Probably the most entertaining interview I’ve done in a while. He asks me to define noir, and I turn into the Hulk. Read it at The Noir Affliction. 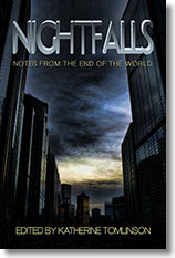 Secondly, I’m very proud to be in Katherine Tomlinson’s NIGHTFALLS anthology, out soon from Dark Valentine Press. The last day on Earth… how would you spend it? If you’re Terence Nightingale, star of my story “Acapulcolypse,” you want to take out as many human beings as possible on your own, which is a real bother when you faint at the sight of blood. The anthology benefits Para los Niños, an organization in Los Angeles that helps at-risk kids and their parents succeed in education and in life, and contains 28 more tales from the likes of Matthew Funk, Sandra Seamans, Allan Leverone, Nigel Bird, Chris Rhatigan, Col Bury, Christopher Grant, Patricia Abbott, Jimmy Callaway and Veronica Marie-Lewis Shaw. My first science fiction story. Hope it worked. Can’t wait to read yours. Same here. Can’t wait to see what you did. Mine’s not science fiction really, though it has elements. Your characters are so distinct that I imagine you could write any genre you put a mind to. Such an interesting theme, I can’t wait to get to look at the book and spend some time with you guys. Thanks.